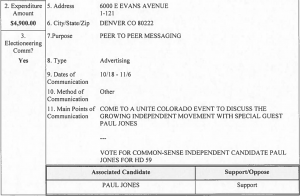 Paul Jones was a late addition to the Unite Colorado slate, replacing Eric Montoya who was “unendorsed” without explanation by the organization over the summer. Two of the candidates are competing in staunchly Republican districts in Grand Junction and Douglas county. The other three house candidates, including Jones, are running in lean-Democratic seats. Backers of the Unite Colorado slate apparently see their last hope in Jones, as the other Unite candidates are now getting minimal or no support from the mother ship. And Jones’s race has no Republican, leaving the Unite candidate running against the Democrat. Unite Colorado’s initial decision to run candidates in safe GOP districts and swing Democratic ones was seen as unfair by some Democrats, and that concern has grown now, as Unite’s spending activity focuses exclusively on Jones. Unite Colorado has spent over $200,000 on Jones in the so-called electioneering window of the campaign, pretty much abandoning its other candidates, according to campaign finance records. Unite America has raised about $900,000 dollars nationwide to back candidates in at least a dozen states, a third of which it’s spending here in Colorado. That $300,000 not only comprises the lion’s share of Unite Colorado’s $400,000 war chest, but the vast majority of it was raised far from the Rocky Mountains. Eighty percent of Unite America’s funds come from out of state, with half of that coming from California. Just eighteen percent is from Colorado. Unite’s deep-pocketed donors are a mixed bag. Establishment Republicans, Hollywood Democrats and Silicon Valley techies are all represented. Meg Whitman, the former GOP nominee for governor in California and a prominent “Never Trump” voice who helped fundraise for Hillary Clinton, gave Unite America just shy of $100,000. Hollywood producer and Los Angeles Dodgers co-owner Peter Guber is a member of the “Founder’s Circle,” as are Bay Area tech mogul Rusty Rueff and former New Jersey GOP congressional candidate Scott Sipprelle. The most prominent local name is Kent Thiry of DaVita, who briefly ran for governor of Colorado as a Republican. 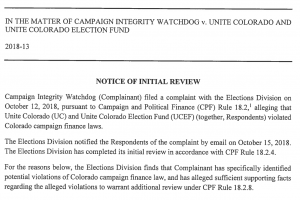 A call to Unite Colorado Director Nick Troiano, seeking a comment on the campaign-finance complaints and his out-of-state funders, was not returned. Also left unanswered is the question of how his organization’s apparent political strategy, which has evolved to spending most of its money to unseat a Democrat, squares with the alleged nonpartisan mission of Unite Colorado. UPDATE 10/29: This blog post was updated to reflect a brief Oct. 27 response, via Twitter, from Troiano. Our response: Hi Nick. Thanks for getting in touch. 1) I called the number for you on Tracer and left a message. I would still welcome the chance to talk to you, and then I’d update my post. 2) The “struggle” referred to four of your five candidates and the validated complaint against Jones. 3) one complaint by Matt Arnold was validated by the Secretary of State, so it’s not just an empty distraction, 4) I will definitely add your denial of the allegation in the latest complaint. Do you want to add any more details on that? 5) I will add whatever you think is relevant. Troiano did not call us back with a more detailed response, so this is all we have for now. But we updated this post to include Jones’ denial about the cost of the event promotion and to state that the Jones race is apparently close. Corrections 10/29: Penalties for coordination alleged against Unite would be civil not criminal. Also, the spending by Unite to promote the Jones event was $4,900, not $35,000, as written originally. Colorado Times Reporter Erik Maulbetsch contributed to this article. Phew! Good riddance to Ralph Nader/Jill Stein purer than thou, passive-aggressive, GOP enablers. So, United Colorado wasn't willing to pay for advice from Katie Kennedy and her Strategic Compliance organization?